Run and walks are the bread and butter of video game animators and unfortunately I hadn’t found a good source of references on that topic in the past. Until today, I wasn’t bothered and used treadmill references since that’s mainly what they have been doing at Pixar from Monsters Inc to Up so if it is good for them, it should be good for me, but it is said that treadmill runs are actually different from the real thing. My understanding of physics is so basic that I can’t see why it would be any different (does anyone actually understands inertia or references frames?) 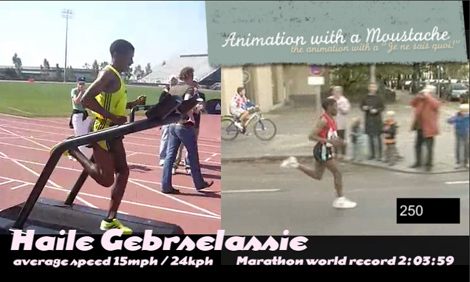 so I decided to do some research and was lucky to find two great references of World record marathon runner Haile Gebrselassie. One of him on a treadmill and a second one shot during a marathon. I didn’t spend too much time on walks since everybody’s walk is unique and I am pretty sure the difference would be too subtle. Before you watch the videos and make up your mind, one thing I should mentioned is that the treadmill run was only a 4 minutes run and he was wiping his face with the towel in front of him few frames before the beginning of the footage. You can find the link to the original footage below. The video on the right is a real marathon race. The upper body is possibly slightly bent forward on the road race but I don’t think there is a real difference for the back leg to be honest, at least not at 30fps. For runs, I would suggest people to pay attention to the running style instead and get to learn about the Pose Method. As animators we are having a tough time to understand runs but don’t worry…. so do runners! What, wait! Three Ringling students made this?!?!! How the hell is this possible ! I just love it, especially the character design. Really good work guys! I want to see a sequel to this! While I am posting, here are some news for you. I am currently attending Nate Wragg’s “character design for production” class and it is awesome. I always manage to screw up and not respect the deadlines but the character I am working on is developing really nicely. I will be posting all my work when the class finishes but here is a little work in progress for you. We are not supposed to do any rendering but I felt I needed to shade this guy for this week’s turnaround. I learnt that painting technique at Schoolism. This is the technique used by Nathan Fowkes, Bobby Chiu and Andrew Hou. 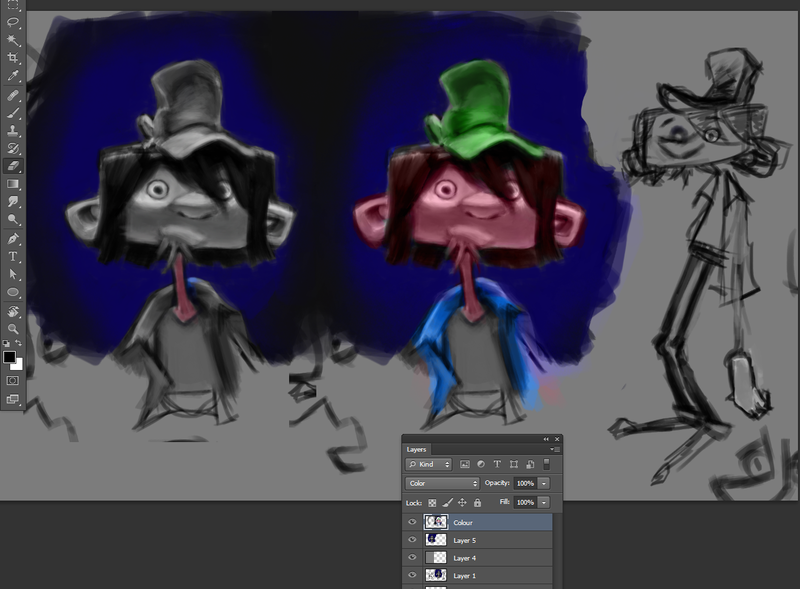 I will probably share my Photoshop brushes at the end of the class. Here is that work in progress, the mouth is completely out of whack but I think it is a fun painting.